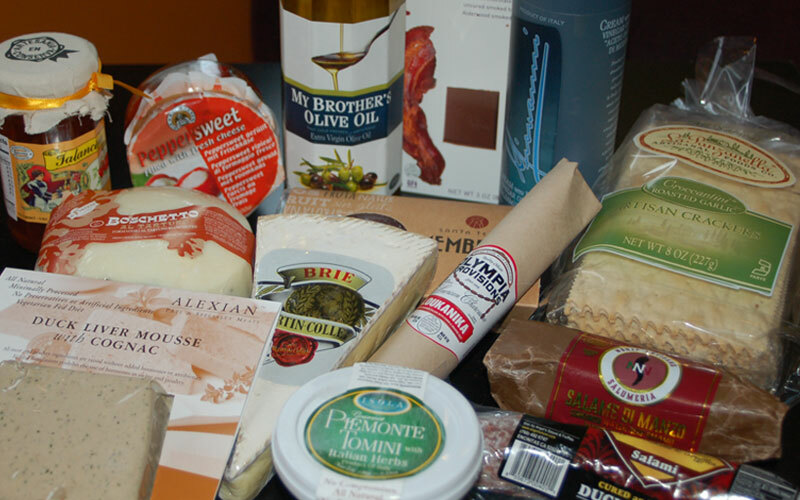 We offer a wide selection of artisan cheeses, delicious charcuterie and a wonderful variety of olives. Try the hard-to-find Iberico del Bellota, our cheese stuffed Peppadew peppers and gorgonzola stuffed olives. Don't forget our fresh baguettes, pretzel bread, Italian flatbreads and crackers, as well as a variety of fruit pastes, olive oils, cream of balsamic and dark chocolate to perfectly complement your wine and beer selections. Choose from a variety of accessories to complete your wine drinking experience–corkscrews, wine glasses, cheese platters, decanters, cutting boards and cheese knives all make great gifts. Check out the refurbished and modified walk-in cooler along the back wall of the store for most of our accessory collection. With its original hardware, it's hard to believe that the cooler was built in the late 1800’s, it looks better than new! TCC has a wide array of made-to-order gift basket options that work with every taste and budget. Fill them with wine, beer, cheese, accessories, chocolate—anything you please. We can also ship wine, beer, cheese, and gift baskets, please call for details. If you're having trouble deciding, TCC has gift certificates of any denomination that can be used for retail or in the cafe. We're happy to take gift certificate orders over the phone and mail to the lucky recipient.